Bryson Foster shows a level of leadership that is rarely seen in most people his age. The Concord, N.C., native, who will turn 14 at the end of June, has touched countless lives through his efforts with the Muscular Dystrophy Association (MDA), which have taken him down some interesting roads. "I've crossed paths with a lot of people I never thought I'd meet," Bryson said. "Not many people my age can say they've sat face-to-face with Faith Hill and Taylor Swift." 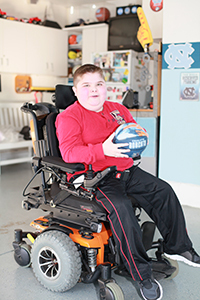 Diagnosed with Duchenne Muscular Dystrophy at the age of five, Bryson uses a Q6 Edge® Power Chair from Quantum Rehab® to stay active. Thanks to his Q6 Edge, Bryson's life is in constant motion. "The Q6 Edge has given me more freedom to hang out with my friends," Bryson said. "If they're riding their bikes, for example, I can easily keep up with them." 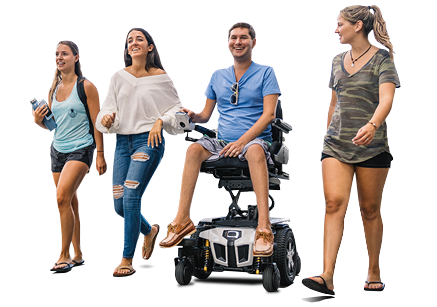 As an MDA advocate, Bryson travels often, but no matter where he is or where he's going, his Q6 Edge makes his journeys both pleasant and seamless. "This chair has been such a blessing," Bryson said. "It gets me wherever I need to go. It has the all-terrain wheels, so I can take it just about anywhere." Bryson was the National Goodwill Ambassador for the MDA in 2012 and 2013. He also co-hosted the MDA Show of Strength Telethon in 2012 and 2013 and had a piece of his artwork, "Shooting for Hope," accepted into the MDA Art Collection. Bryson spends much of his time raising awareness about muscle disease and doing his part to end it. He has traveled the country speaking to sponsors and families about the MDA and inspiring others to join the cause. He has even met some famous people along the way. Most recently, Bryson interviewed Poison frontman Bret Michaels at the MDA's Ride for Life event in Bethlehem, Pa.
"Bret Michaels was a really great guy to meet," Bryson said. "We talked about sports, how he's handled his diabetes and what was next on his schedule. He even brought me up on stage to sing with him. We decided we were going to have 'Nothin' But a Good Time,' and that's what we did." At school, Bryson is an honor roll student. He is also the voice of his school's sports teams, announcing wrestling, basketball and baseball games, and he has served as the football team's manager. "Sports and announcing are two of my greatest passions," Bryson said. "In school, my favorite classes are social studies and P.E. I also love history." Perhaps the most important thing in Bryson's life, however, is his family. His parents, Phil and Claire Foster, have always taken care of him, and they taught him to accept no boundaries. "My parents are the best," Bryson said. "Together, we're like the Three Musketeers. If you see one of us, the other two aren't far behind."